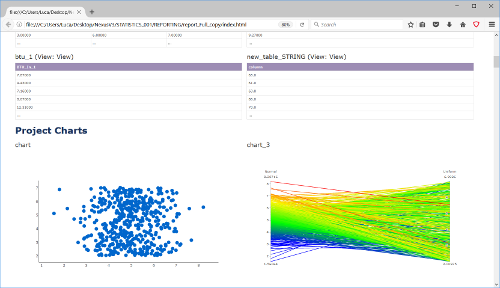 We are proud to announce the release of Grapheme v. 2.2, our intuitive and powerful data visualisation and analysis tool. Nexus version 3.1 has now been released and available for download and update. iChrome’s optimization solution Nexus, has been used by Vortice, a leading ventilation systems manufacturer, to optimize the aerodynamic performances of a flow deflector for a Heat Recovery System. The main objective of the work was to improve the initial geometry of the deflector in order to achieve optimal flow uniformity at the outlet while reducing the pressure drop across the component. We are proud to announce the release of Grapheme v. 2.1, our intuitive and powerful data visualisation and analysis tool. Automatic Project Reporting: a new Tool has been added to allow extracting data from existing projects and organizing those in Html self contained reports. Reports can thus be archived and shared. We are proud to announce the release of CAE Viewer v.2.0, our Portable and User-Friendly FEM Visualization toolset. CAE Viewer is a Free, Portable and StandAlone tool for 3D visualization of CAE models and results. It enables full 3D interactive visualization along with high performance rendering capabilities. More information and link to download the latest version of the CAE Viewer can be found here. We are proud to announce the release of Nexus v.3.0, our intuitive and powerful Process Integration and Optimization framework. Triggered by the unintuitive and high costs of existing design optimization software applications, iChrome set about developing a more user friendly and affordable optimization solution. Nexus v.3.0 pursuits our mission and deliver even Highest Standards in Process Integration and Optimization. At iChrome, we are proud to announce the release of Grapheme v. 2.0, our intuitive and powerful data visualisation and analysis tool.